Guitar-based instrumental hard/classic rock featuring Blaze Bayley on vocals & Thundersick on drums. Good grief. Not another album by a guitarist determined to burn up the fretboard with his technique and pace... Erm no, that isn't the case here at all. Because Cris Martin is not that type of guitarist at all. In fact, what he does, comes straight from the heart and soul, with the emotion flowing through the fingers. He has the skill to compete with any of the flash, hard riding guitar heroes who litter the world. But instead of doing this, he delves deep into his emotions, using his inspirations and aspirations to come up with an album full of music that means something to him – and therefore, will to you. Martin has experience behind him. He was a member of the band Thunderstick in the early to mid 1980s, appearing on the well received album 'Beauty And The Beasts' in 1984. Following this stint, Martin formed a band called Fired-Up in 1992, having also worked as a session musician. In recent times, he was in a Bon Jovi tribute band called Non Jovi. 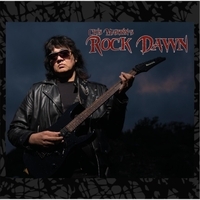 And he has brought all of this experience, and more, to bear on 'Rock Dawn', his first solo album. And it is very much a solo effort. Not only does Martin play all the guitar parts, as you would expect, but he also plays almost all the other instruments you hear. The only exception to this is on the keyboards, for which he brought in Nick Payne. Oh, and there are also two very special guests, both of whom have distinct Iron Maiden connections. On drums there's the mighty Barry Graham (aka Thunderstick) – reuniting the pair for the first time in three decades – who not only performed with Maiden in their formative stages, but made his reputation after this as a core member of NWOBHM heroes Samson. On vocals, it's the redoubtable Blaze Bayley, who recorded two albums with Maiden. But he's most known for his ongoing situation fronting the ever popular Wolfsbane. The passion and quality these two bring to the project can be heard on 'Call Of The Wild'. It's one of the album's stand-out moments, and features both of them complementing the assertive style provided by Martin. Throughout the 12 tracks here, Martin displays a welcome diversity, but there's also a distinctive coherence, ensuring everything has a crucial, individual style. Martin melds together a wide ranging sensibility. You can pick out a range of influences, from classical to metal to blues and acoustic music. But what ultimately comes across is the expert way in which Martin crafts each track. There's a loving attention to detail. But this never overrides the essence of his appeal, namely the aptitude to balance a deep desire to be instinctive with a need to remain focused and objective. He achieves this so well that the overall impact is clear, concise and charismatic. 'Rock Dawn' is far more than merely a good solo album from a creative musician. It's a bold statement of intent.